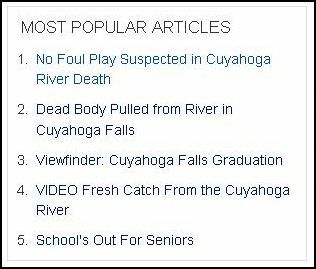 Um, is is just me, or is this sidebar of the most popular news stories on my hometown's news website, Cuyahoga Falls Patch, a liiiiittle bit awkward? How's that for some uncomfortable juxtaposition? Ok I had to read it like 3x all the way through to see what you pointed out. Damn you're good. I wouldn't have ever thought twice (though I probably would have only skimmed a word or two from each) if I saw that on my own! Haha! I laughed at the first graphic, too funny. Thank you for clarifying that you got it without my help. FINALLY, SOMEONE. DUN DUN DUN. Very suspect. Love the new layout, by the way! I got it the first time! Hilarious. It's like they don't even know what they are talking about. Typical smalltown mistake, haha. lot this week, so they both showed up there. Awful! Ha! I saw this before you edited it to show the awkward titles and laughed. :) Just... not good. Not good at all. 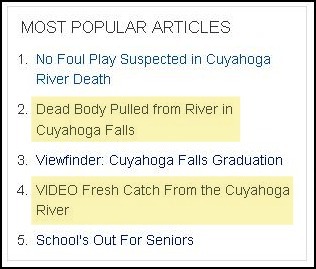 Dead body in river. Graduation! Fishing. Seniors! SO AWKWARD. I actually noticed the connection between #2 and #4 right away! In fact I thought that's what you were initially pointing out! Dude, I totally got it. Also, your comment about my awesome Jew-ness made me realize I use the phrase, "saving a few shekels" ALL THE TIME. Either it's going to become my *thing* or I need new material. I got it the first time around and it's definitely awkward. And a little cringe-inducing.